Two women who lost their lives in a pileup on an East County freeway interchange were publicly identified Thursday as a mother and daughter who both worked at Naval Air Station North Island and lived down the road from each other in Ramona. 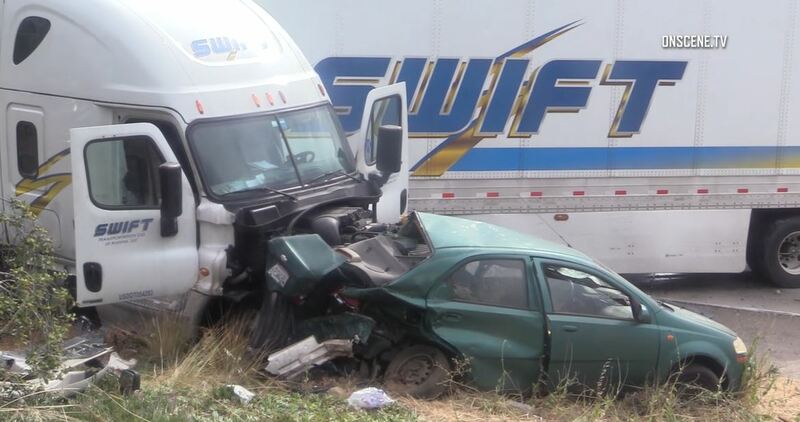 Nancy Bauerlein, 57, and 29-year-old Jennifer Thompson-Campbell were in a Chevrolet Aveo hit by an out-of-control big rig on the transition ramp from northbound state Route 125 to eastbound Interstate 8 in La Mesa about 2:30 p.m. Wednesday. Bauerlein, who was behind the wheel of the compact car, died at the scene, according to the county Medical Examiner’s Office. Her passenger, identified by a relative as Thompson-Campbell, was taken to a hospital, where she was pronounced dead a short time later. Timothy Thompson, the son and brother of the victims, told NBC 7 his sister was a mother of two who was a week shy of her 30th birthday. Both Bauerlein and Thompson-Campbell worked at Fleet Readiness Center Southwest in Coronado. The accident, which left four other people injured, occurred when the driver of a Freightliner tractor-trailer suddenly swerved to her left for unknown reasons while traveling on the transition road from westbound I-8 to southbound SR-125, the California Highway Patrol reported. The cargo vehicle crashed through a metal guardrail, crossed the northbound lanes of SR-125 and plowed through a concrete divider before colliding with the Aveo on the adjacent connector. Both vehicles then crashed into a Kia Sorento, after which the big rig came to rest jackknifed across the transition road. A backseat passenger in the Sorento, 6-year-old Kristina Andarus, suffered major injuries in the wreck. Her mother, who had been driving the SUV, told reporters her daughter might be paralyzed. The child apparently had not been properly restrained in the vehicle, the CHP reported. The woman’s mother, who had been riding next to her in the Sorento, was left with a broken leg. The 34-year-old driver the tractor-trailer and a 41-year-old man riding in it were treated at a trauma center for moderately serious injuries. The names of the two — both residents of Marietta, Georgia — have not been released. Investigators, who do not believe the trucker was intoxicated at the time of the crash, expect to take weeks or months to reach a final determination on the cause of the accident and whether the commercial driver might face any charges for her involvement in it, according to the CHP.